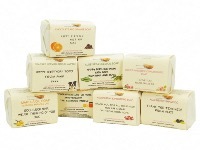 TURN ONE OF OUR SOAPS IN TO A MEMORABLE AND CUSTOMISED GIFT BY ADDING YOU OWN MESSAGE TO THE PAPER SLEEVE. JUST EMAIL US WITH YOUR MESSAGE AND YOUR CHOSEN SOAP VIA THE LINK ON THE ORDER. THIS A GREAT PRESENT FOR ANYBODY ENJOYING OUR RANGE OF NATURAL SHAMPOO BARS AND SOLID CONDITIONERS. THIS A GREAT PRESENT FOR A SPECIAL OCCASION. PLEASE JUST TELL US A LITTLE BIT ABOUT THE PERSON YOU SENDING IT TO AND WE WILL CHOOSE THE PRODUCTS FOR YOU OR LET US KNOW WHAT YOU WOULD LIKE TO BE INCLUDED. COMES NICELY PRESENTED IN A JUTE TRAY AND FABRIC WRAPPING WITH NATURAL BOWS. AND WE CAN INCLUDE A SHORT MESSAGE FOR YOU. RECIPIENT WILL ALSO RECEIVE FREE SHIPPING.